Sorcerer King dares to be different, and that’s a bold move by a company known for their mastery of the 4X genre. 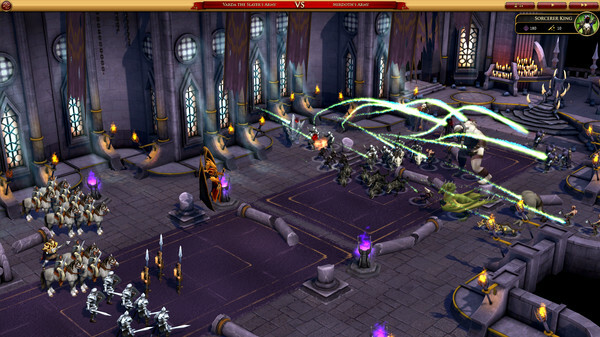 We review Stardock’s latest, where you start out already having lost. Let’s go back a few steps first though. Imagine any fantasy 4X or strategy game – and imagine playing it all the way through and conquering the final goal. Your foes are conquered, your reign is absolute, and the entire kingdom is at your feet. Now look at the world of Sorcerer King, where that character is… not you. That character is the Sorcerer King, and you are merely an obedient sovereign in his empire. You’d also be wise to keep things that way for a while, because he could crush you for looking at him wrong. So the odds are stacked against you, and then it gets worse. Word reaches you that the Sorcerer King intends to ascend to godhood, and in the process of doing so he will destroy all life within his kingdom. The pressure is on, since he’s not going to sit around and wait for you to carefully plan your strategy and accumulate resources and build an army. There’s a doomsday counter in place, and when it runs down – so does your life in the game world. The dynamic that this creates is incredibly interesting. On the one hand you’re pressed for time and need to make haste in overthrowing the Sorcerer King, but on the other hand you don’t want to be noticed before you’d ready, because he can easily strike you down. Upon each new game start, you first select a type of sovereign. There are six different types, ranging from a wizard to a tyrant – and all of them can be customized as well. This isn’t merely an aesthetic move – the choices you make affect the start and plot development within the game as well. Your skills will develop differently when you’re a wizard, and you might be viewed differently by the Sorcerer King if you choose to play the role of a tyrant. Before starting the game, you also select and customize the game map that you’ll be playing on, after which you get thrown into a game world where you co-exist with over sovereigns – each with their own agenda. 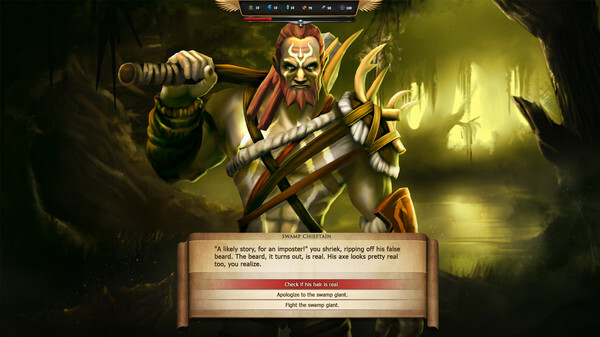 Although Sorcerer King is a 4X game by nature – even with its major twist on the formula – we found that there are some heavy RPG and adventure elements in here as well. There is a heavy emphasis on storytelling, and plenty of opportunities along the way to work with or against individuals that you encounter. What’s important to note is that you’re not doing much empire building here, as would be the case in a ‘normal’ 4X game. Instead, you’re constantly scheming. Scheming, scheming, scheming. Primarily against the Sorcerer King, but also against and with your fellow sovereigns. You’ll want one of them to join you, but you’ll want another to rile up their people and rise up – for the sole purpose of diverting the Sorcerer King’s gaze away from your own actions. And last but not least, you definitely don’t want any of the other sovereigns to declare war on you – you have enough to worry about already. Aside from these RPG/adventure-like choices, there is also a tactical battle system in place. You can choose to let an “auto-battle” system take care of that for you, or you can fight the battles yourself. Whenever you’re successful, you will gain experience and items that allow you to grow in skill and power – with the ultimate goal of telling the Sorcerer King you’re not going to take it anymore and are ready to challenge him. There’s a long and hard way to go before you reach that point though – this is a difficult game that doesn’t do much hand-holding. There’s a tutorial in place, but you’ll learn most of what you need to know during your first few unsuccessful playthroughs. You’ll take too much risk by heading into battle too early, you’ll rub another sovereign the wrong way through some bold decision-making, and before you know it…. you’ll face the wrath of the Sorcerer King. Stick with it though, and you’ll find yourself immersed in a deep and ultimately rewarding experience. It’s a new formula, even for Stardock (read more in our interview with them here), but it’s a risk that has paid off for them. It’s not a perfect game as it’s lacking in the multiplayer department and takes some perseverance to get the most out of it, but once you get to that point you’ll be glad you invested the time it took you to get there.